Spring temperatures make it the perfect time to get outside and do a routine checkup on your car, as winter weather can take a toll. These four car care tips will get your car in tip-top shape before hitting the road for a spring getaway. Experts recommend getting oil changed every 3,000 to 5,000 miles. This keeps the engine running well and prevents future damage. When you’re at the dealer, get power steering, brake and transmission fluids checked. Winter can be rough on a car’s tires. Check the air pressure and add more air if needed to maintain the recommended pressure from your car’s manual. Tires should be rotated every 5,000 miles, so take your car to the dealer or auto shop when due. Snow and rain can cause tears or cracks in the wiper blades, as well as chips in the windshield. Make sure they’re both in good condition for spring rains. Check for worn belts and hoses. There can be visible damage of cracks and frays from the cold temperatures, in which case you may need to get them replaced. If you need to lubricate specific sections in and around motors and engines, WD-40 EZ-REACH is the perfect helper with its permanently attached, eight-inch flexible straw that bends and keeps its shape to get the WD-40 Multi-Use Product you know and trust into hard-to-reach areas. To see how WD-40 EZ-REACH helps tackle automotive maintenance, please visit www.WD40.com. 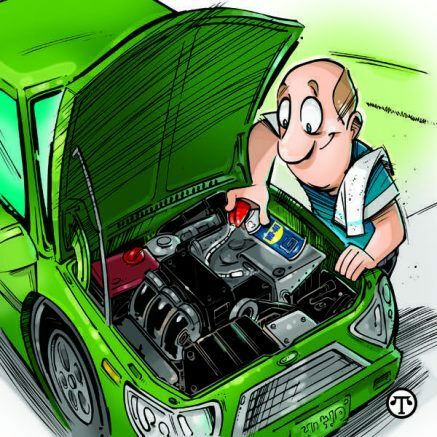 Be the first to comment on "Spring car care tips"